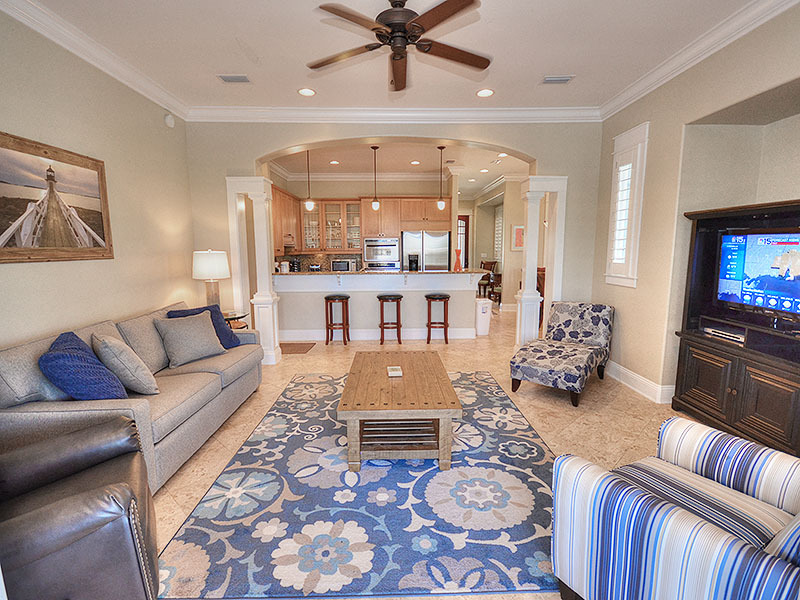 Beach Club BC3, 3 Bedrooms, 3 Bathrooms, Sleeps 9. Beach Club Cottage. Private Hot Tub and BBQ Grill. No Check In required - go directly to your unit and start enjoying your vacation as soon as you arrive! This single family home is nestled in the private cottage area of The Beach Club. This home is easy access with no stairs or elevators to wait for. It is a 3 bedroom, 3 bath home on the lake. There is lots of room for a family or group to get comfortable. Sleeping capabilities for 9. There is tile throughout (except for 2 guest bedrooms that have carpet). A private screened in patio provides additional entertainment area. Walk out of your master bedroom to enjoy a cocktail in the hot tub. Been swimming at the beach? Take a quick shower outside to wash off before coming back in the house to relax. This home is comfortable and private - you still have access to all the pools, but don't have all the other guests to deal with! All the pools are accessible to Cottage guests except the main pool attached to clubhouse. The owner does NOT have a club membership so these amenities are not available: Indoor heated pool, outdoor main pool, jacuzzi, wading pool, tennis courts, basketball courts, children activities, poolside live entertainment, game room, ping pong, cabana bar and outdoor dining. There is a trolley provided by The Beach Club that runs about every 15 minutes to take you to the beach or pools. Pick up locations are by the tennis courts or walkway. Cottage is updated and looks even better than the photos. We really loved the location and didnâ€™t mind the few extra steps to the beach. The condo is private and has a beautiful backyard atmosphere. The only bummer was you couldnâ€™t purchase access to the Beach Club amenities. It wasnâ€™t a huge deal most days, but was a little bit of a disappointment on the first day and not being able to get lunch at the main pool area. Other than that our stay was perfect. Beautiful house and view. Convenient to Beach Club pools/beach. Jacuzzi outside didn't work the first day but we just used it as a plunge pool anyway. Wish we had the option to pay extra for Beach Club membership access. We are already booking this cottage for next year! The property was very nice!!! The property was just like the pictures.. The master bedroom had a stunting ensuite!!! The kitchen was very elegant with everything you need... Over all it was very nice and clean!!! I would definitely stay here again.. Loved the house, hot tub, the view out back & that you can walk across the street to the BEACH!! That was a total bonus! We will definitely be back!! I never could figure out the app thing but they helped me through! The place is just like the pictures and is very well kept. The hot tub is so great and you will use it more than you expect! The rooms have little less space than I anticipated, but were still great and very comfortable. The beds were all very comfortable and we really have no complaints at all! Great place! Super cute airstreams at the front of the neighborhood also! Overall the place was great! We will be returning. Minor things that didn't impact the trip were the thermostat wouldn't go below 70, the master bed was uncomfortable and we wished we had access to a couple of things on the property. Tennis courts, bikes, and fitness center are amenities that do not come with this rental. I cottage was beautifully updated! Upon arrival I immediately took my luggage to the master bedroom where I found a medication tablet on the floor. Out of curiosity I googled it and it was a muscle relaxer. I'm so glad that I found it on the floor and not my toddler. I was surprised that house keeping missed that when sleeping it was in plan view upon entering the master. The other issue we had was the lack of cold air from the central ac unit. The lowest it would go was 70Â° it was HOT at night when trying to sleep. Thankfully the kids and other adults were able to utilize the fans but my self and my husband have issues with fans and allergies. The central ac could go down at least to 65Â° in my opinion. Other than that, the cottage was nice and otherwise clean. Some furnishings were different than pictures on this site BUT it was a good update to furniture. We would definitely stay in this cottage again. It was very comfortable and nice. However, hopefully the cleaning crew will double check the floors and lower the temperature!!! Thanks for your feedback. Guests are instructed to use the guest app to communicate to guest services to cover any issues during their stay. We did send an email to this guest asking if there were any issues during their stay. They failed to reply. If this guest had informed us of the temp issue, we would have sent service to investigate. We have submitted a service ticket and the temp has been resolved. We look forward to your return very soon. The location and access to the beach was great. We would stay there again without hesitation! Would have given it 5 starts but the skillets need to be replaced, screened in porch fixed, and there was no full length mirror anywhere. Thanks for your feedback. This guest should have contacted guest services through their guest app that all of our guests use during their stay. With a 99% guest service satisfaction 5* rating, our support staff could have resolved the guest's issues during their stay, if the guest had just contacted them. Guest services sends notifications by emails and text messages to all of our guests to let them know if they need any assistance or issues resolved during their stay to contact Guest Services through the guest app. This was the second year in a row we stayed here. Loved the location, the beach and the house. Beach Club cottage, great place. Property was very nice, clean and roomy. Only drawbacks were , not informed about all resort amenities we're not included in rental price. Plus cable tv service was not working for first 4 days we were there, i had to call cable company myself. Thanks for your feedback. This cottage offers a private hot tub and grill that only guests of the cottage can use. The Clubhouse pool is privately owned and requires a few to access. All other outside pools are free to access. Most guests love this cottage for the private hot tub and grill. CenturyLink had an issue with the cable service. This is beyond the owner's control. The issue was resolved. Nice place. Would highly recommend the owners become members of the clubhouse so that their guest can pay to use the indoor pool.